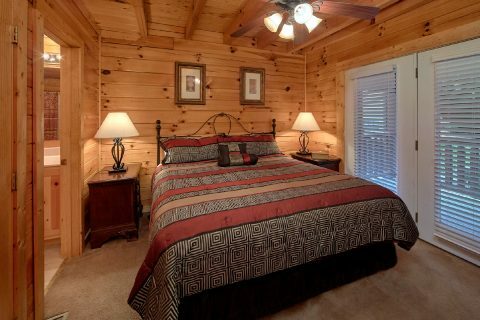 Get ready for an unforgettable Smoky Mountain group vacation when you book "Smoky Mountain Lodge," a comfortable 7 bedroom cabin rental in the beautiful Mountain Park Resort area of Pigeon Forge. 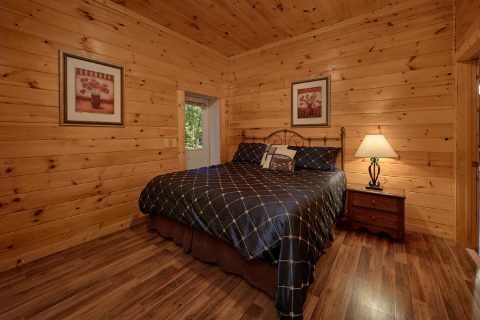 This spacious 7 bedroom cabin rental offers comfortable sleeping space for up to 17 guests and 7 and a half bathrooms, so there's plenty of room for your family or friends. 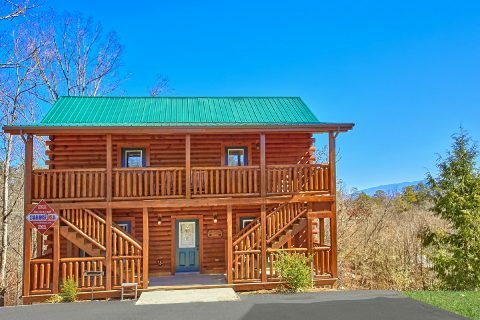 Better yet, this rental boasts a prime location that's only a mile from the action-packed Parkway of Downtown Pigeon Forge! 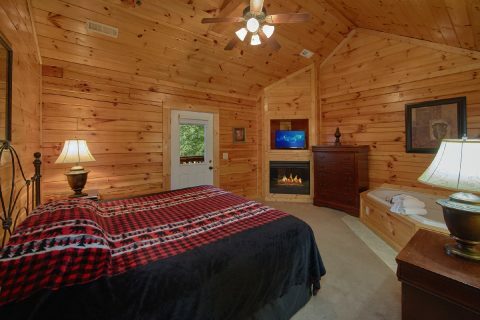 As a result, guests of this cabin can easily reach top local attractions like The Island, The Historic Old Mill, and the thrilling rides and attractions of Dollywood Theme Park. 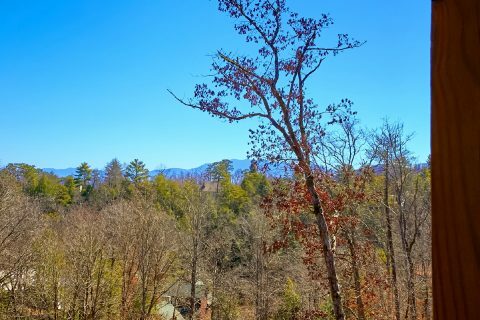 The main drag in Pigeon Forge also offers quick access to Gatlinburg and the Great Smoky Mountains National Park, where you can enjoy invigorating hikes in the mountains and explore beautiful forests and waterfalls. 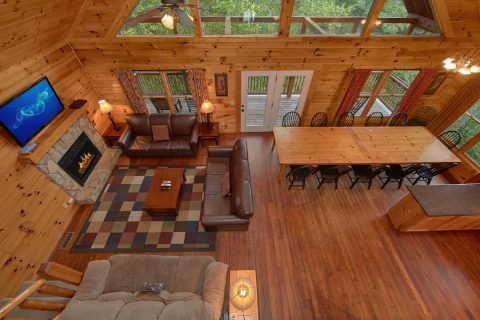 When you return to your cabin after a great day's adventure, you'll love unwinding in this large group rental that provides everything you need to relax. 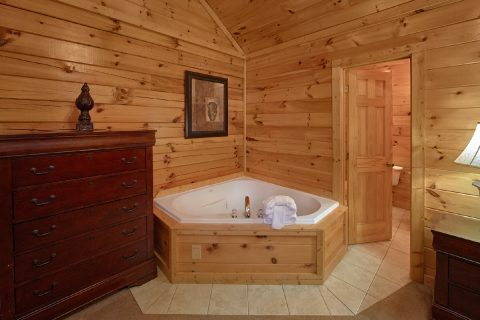 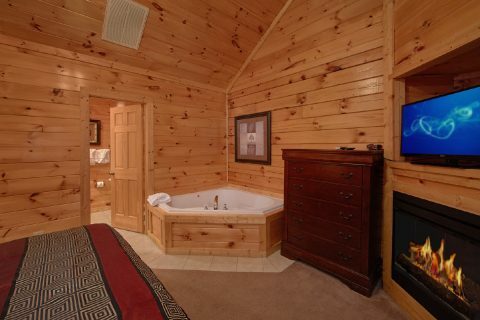 Not only does this cabin offer great amenities like a hot tub, 4 electric fireplaces, and a theater room, but you can also enjoy swimming in the Mountain Park Resort swimming pool during the warm summer months! 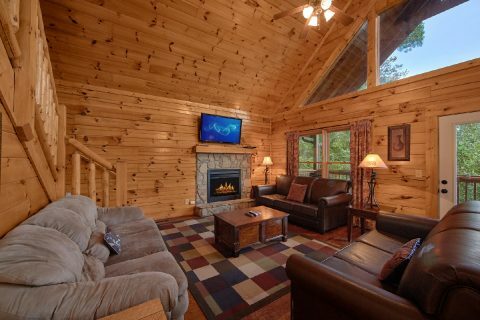 The main level living area provides a welcoming space to enjoy quality time with friends and family by the electric fireplace and television. 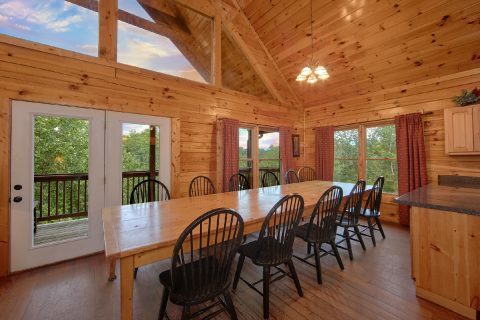 Additionally, this room features vaulted ceilings and large picture windows so you can truly enjoy the mountain scenery that surrounds your rental. 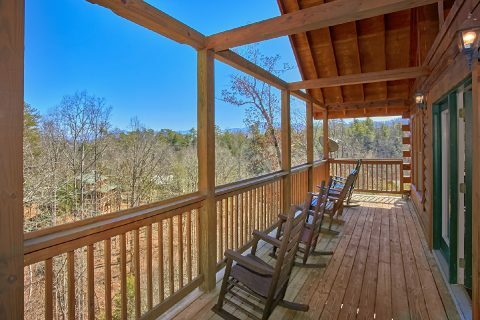 From here, you can step outside onto your cabin's covered deck to enjoy a breath of fresh air in the mountains. 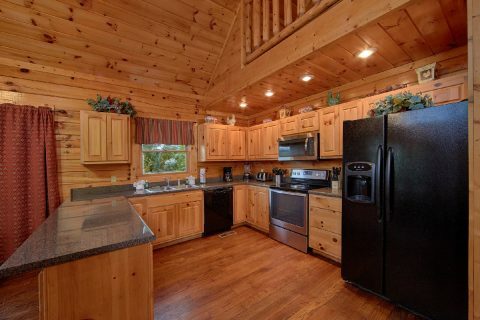 The main level is also home to your cabin's full kitchen and dining area where you can prepare delicious meals for your group to enjoy in the comfort of this spacious rental. 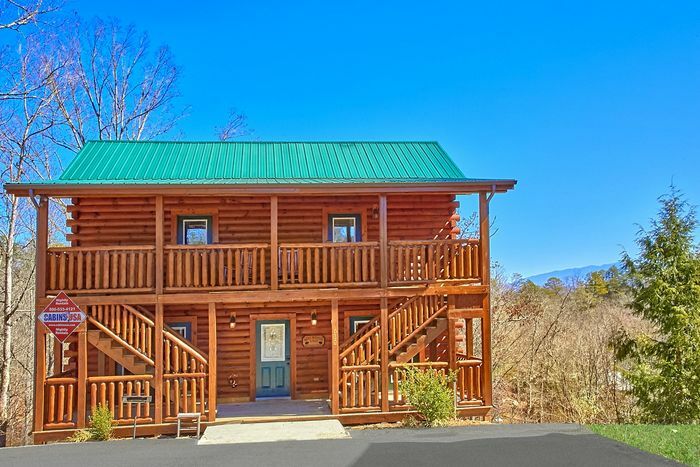 There's also a charcoal grill for enjoying a cookout on your Smoky Mountain vacation. 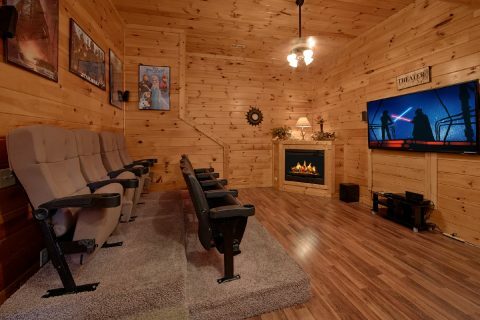 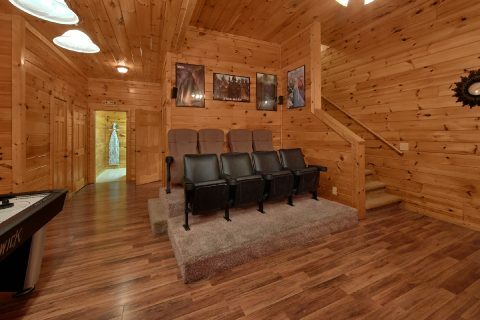 Downstairs, you'll find even more entertainment in your cabin's theater room that comes complete with a large screen and real theater-style seating. 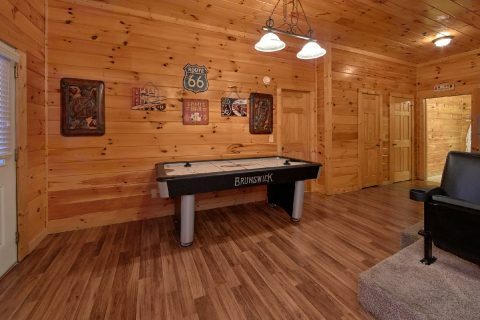 This room also features an air hockey game. 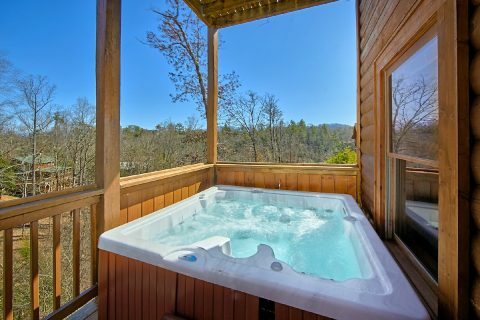 For relaxing in your cabin, you can also enjoy taking a relaxing soak in the outdoor hot tub or you can unwind in the privacy of your cabin's indoor jacuzzi tub. 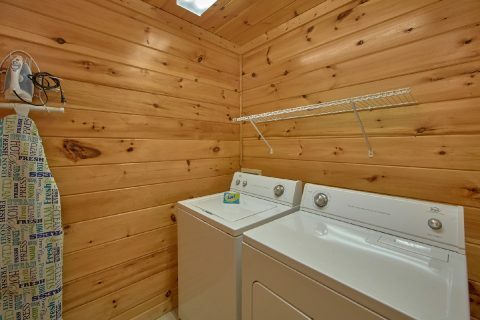 This rental also features practical amenities like WiFi Internet and a washer/dryer for guests to use during their stay. 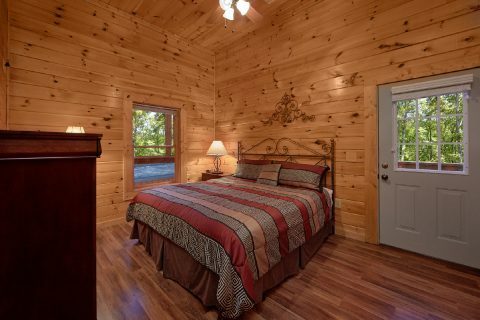 Once you're ready to get some rest on your vacation, you can look forward to sleeping in one of this cabin's 7 private bedrooms. 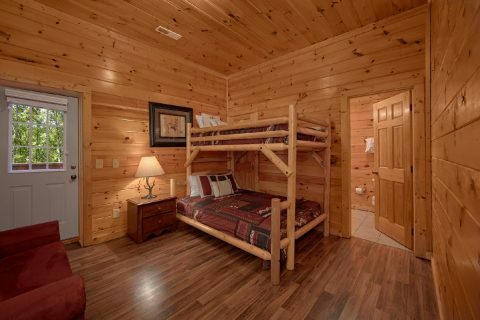 On the main level, you'll find 2 bedrooms with king-size beds and downstairs you'll find 2 more king-size bedrooms and a bedroom with a twin over a full bunk bed. 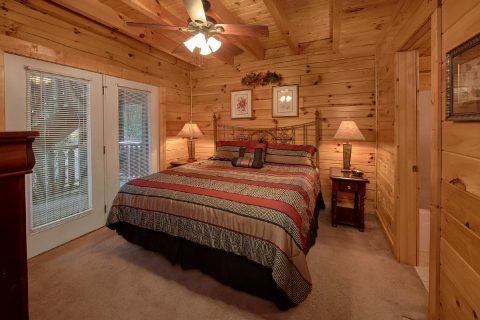 Lastly, the upper level of your cabin comes with 2 more king-size bedrooms. 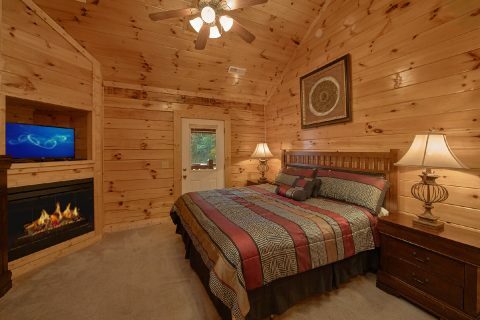 Book your spacious group cabin near Downtown Pigeon Forge today with Cabins USA to save 15% on your nightly rate with our special cabin discount!